Ah, Spring is finally here! 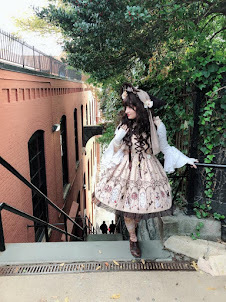 Just yesterday I went out for a bit, doing frilly things, and running frilly errands with some close family and it was just so beautiful I had decided to dress to the nines. There was a bit of breeze that accompanied the day so I paired my Fragrant Rose Memories Camelot jsk witha chiffon top that was just enough to keep me warm without being overpowering. I know I had already paired this particular piece with my 3F bonnet but I felt that the different in blouse and the splashing of pink really played well with making everything pop and be more Spring-ish. I don't wear pink myself (kuro loli all the way) but love the outfit you've put together...the pink really balances well with the accessories. It's winter here in Australia though so no Spring outfits for me lol.